Aitor Karanka has admitted he will get things wrong as he makes his way in the managerial game after picking up the reins at Middlesbrough once again following an eventful weekend. 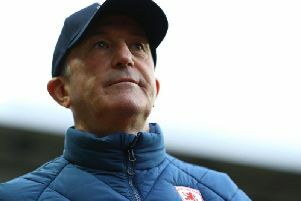 Boro's head coach was conspicuous by his absence from the touchline at Charlton on Sunday after being temporarily relieved of his duties amid rumours of a dressing room bust-up with some of his players. The 42-year-old Spaniard was handed back control on Monday evening after chairman Steve Gibson brokered a peace deal and will be in charge on Friday night when Hull head for the Riverside Stadium for a Sky Bet Championship promotion showdown. Asked what he had learned from a turbulent few days, Karanka said: "A lot, a lot of things, but every single week, every single training session because I am 42 years old, I have less than two-and-a-half years' experience and always I am learning - when I was a player, when I was an assistant, when I was a national Under-16s team coach - that's life. "You have to learn, and it's important that you learn and you keep going. Every single day is different and every single day, you have to deal with different situations because most of them are new for me. "I am starting my career, I am learning. "Obviously sometimes I will be right and sometimes I'll be wrong, for sure - and for sure, more times wrong than right." Karanka was quizzed about the reasons for his absence at Charlton with assistant Steve Agnew presiding over a 2-0 defeat, but declined to elaborate, insisting only that the defeat was evidence that he and his players need each other if they are to achieve their aims this season. He said: "The best example was the game. "When a team is not committed with the coach, with the manager and the manager is not on the pitch, those players fly on the pitch, and my players didn't fly on the pitch. "The past is past. It's true it was a different situation, but again, the main thing is Middlesbrough Football Club and the team and the aim to get promotion this year." Boro, who will be missing only injured defender Daniel Ayala, go into the game having taken just 12 points from a possible 33, while Hull have hit a similar rough patch and are without a win in four games after Tuesday night's 1-1 home draw with Nottingham Forest. Tigers boss Steve Bruce could have Jake Livermore back from a knee injury, but fellow midfielder David Meyler is likely to miss out through illness and will join Nick Powell and Shaun Maloney on the sidelines.